Any meaningful EQ assumes that you have charged the batteries sufficiently the reach the EQ Voltage setting. it's only then that you will see any benefit. You be better off setting the Bulk amps higher to get to 62 V as fast as you can, let the batteries decide how many amps they will accept. Otherwise raise the Absorb ( volts and time ) and do it slow over a period of time, measured in days. Sounds like the main thing I should do is to just let EQ run longer. I've increased max amps for bulk from 80A to 90A, which is 9.7% of C/20. I doubt this will make any difference, though; max bulk current tends to be around 60A during the day, since it comes from the panels less house load. I've increased absorb voltage slightly, from 58.5 to 58.8V, which is the top of the recommended range. I was reading in the Trojan Industrial User's Guide about their recommendation for an initial boost charge. It's similar to an EQ, but with slightly higher recommended current limits. These batteries never had that done. Boost charge is complete when SG readings remain constant over three successive hourly readings and all cells are gassing freely. Trojan's documentation doesn't provide clear guidelines for "regular" EQ, beyond just specifying the suggested EQ voltage. Victron suggests charging at 3 to 5% of capacity, and letting voltage rise to the recommended EQ level, then keep going until SG stops increasing, which they say can take 3 to 6 hours. They also say that SG readings on low-antimony batteries are unreliable, and that it's better to watch for when charge current stabilizes after steadily decreasing. These batteries are about 5 months old. They've been cycling every night down to about 88% SOC over the last 34 days only, including roughly 4 days down to 75% SOC. During the 4 months before that, I'd estimate another 30 nights to 88% SOC, and 3 or 4 excursions below that (as reported by the battery meter). The rest of the time was spent in low-float (52.8V). That totals to roughly 8 to 10 nominal charge throughputs. -- Is it too late to do the boost charge? If not, are there reasons to prefer one approach over the other? -- Should I stay with 2% of C/20 for EQ as suggested by Trojan tech support, or go up to 3 to 5% as suggested by Victron? Why would it be to Late to do a Boost charge ?? It's known by another name " Equalization Charge " . I thought you and North Guy had discussed this before. 2-3-4-5- % makes no difference, you'v got to get to 62 V first. To get there is doesn't matter how many amps you use unless you have a constant current charger and you don't. When you push a over voltage into a battery it takes whatever amps it takes to maintain the voltage. Why would it be to Late to do a Boost charge ?? Trojan's User Manual makes it sounds like a one-time-only thing. It's known by another name " Equalization Charge "
They describe is as a high-current version of EQ, not the "regular" thing. 2-3-4-5- % makes no difference, you'v got to get to 62 V first. Sure. What I was wondering is whether to get to 62V by cooking at 2% for a long time. The system has been in EQ again now for 2 hrs; same problem as before, with voltage at about 60.4V. I raised the current limit to 30A (3.2%); that allowed voltage to rise to 62V. To get there is doesn't matter how many amps you use unless you have a constant current charger and you don't. What I have is a charger without an "EQ" mode, that requires manually setting both a voltage limit and a current limit. Ok, fine. now you are starting to do a Boost, Equalization, Maintenance or what ever you want to call it. Watch the temperatures , stay below 115 F and check the SG's on your pilot cell every hour. It will be a faster SG rise in the beginning, the closer you get to 100% SG level to the filled Electrolyte the slower it will rise. Check it every hour. How long ?? When it stops rising, it takes as long as it takes. Your right in the 90 day hole, thats about how long it takes to start heading toward the abyss. Ok, fine. now you are starting to do a Boost, Equalization, Maintenance or what ever you want to call it. Watch the temperatures , stay below 115 F and check the SG's on your pilot cell every hour. It will be a faster SG rise in the beginning, the closer you get to 100% SG level to the filled Electrolyte the slower it will rise. Check it every hour. How long ?? When it stops rising, it takes as long as it takes. It's 12:30am here. I can't babysit this thing all night. I either need to abort and try again tomorrow or the next day (after the next absorb, which doesn't happen at a predictable time), or set the max charge current to a lower value and let it cook unattended overnight. Your right in the 90 day hole, thats about how long it takes to start heading toward the abyss. Thats fine, they'll be waiting for you when you start again. You have to take a big swing now, once you get the SG's up, you know that deficit charging got you there, you have already added .3 volts ( doubt that's enough ) but you can monitor the SG level and make adjustments to the Voltage and Time. It's a process, thats the best i can tell you. If your a visual person, imagine the plates coated with lead sulfate, like icing on a cake, as the process begins ( High Voltage and Gassing ) it will turn the electrolyte murky as it's driven off and suspended in the electrolyte. The Sulfuric acid will recombine with the water and the electrolyte ratio will start to climb. The lead flakes will settle to the bottom of the battery in the sump. As the plates become clean you are opening up the pores in the lead and new receptors. It's this last process that restores your battery to 100% and brings the Electrolyte back to it's original state. If sulfate is not removed before it crystallizes it becomes a hard shell and cannot be removed or recombined. Underneath the hard coating dendrite spikes grow through the separators and short the cell. I decided to let it run overnight, unattended, with the current limited to 18A. Voltage stayed at 60.4V all night. SG this morning is 1.230 (up from 1.210 the other day). Trojan tech support suggested running absorb for 4 hours at 59V before starting EQ -- so at least that's in the general direction of what I actually did. Unfortunately, the charger popped out of EQ mode shortly after I measured SG, so I'll have to wait until this evening or possibly tomorrow to make another run at it. Any idea how long it takes for the sulfate to crystallize? From what I have read, sulfates begin to crystallize within hours of "no current flow". Generally, the idea is to start charging by the next morning if the battery is below ~75% of charge. Don't let the battery sit "unused" below 75% SOC for day or more if you can help it. However, there is an entirely different method of running lead acid battery banks. For example, run the bank between 50-80% state of charge (this means charging and discharging pretty much daily) and then charge >90% every 5-10 day or so (one batter vendor said once every 28 days was OK too). For example cycle weekdays and recharge >90% SOC on Sundays. The battery is much more efficient in charging/discharging in this range--And may actually last longer (charging >~90% SOC and equalization is actually sort of hard on lead acid batteries (use lot more water, generate hydrogen/oxygen gases, erodes plates and drives oxygen into positive plate/grid, raise battery temperature, etc.). No guarantees--Just a suggestion into other options you may want to look at. You are fine and you got a nice rise without being at a higher voltage and thats ok. I have no idea exactly how long it takes to crystallize , but your batteries are not there, all you had was a build up from deficit charging. Just keep working on them so you get back to 1.265 - 1.280 range. BB pointed to a plan that some use, I think North Guy does a 7-10 plan for a full charge and any correction he needs to make. Your better off keeping it under control then making it a hard , have to thing. The 3 variables of Charging, ( Voltage - Time - Current ) some variation of the 3 will get you where you need to be. My new Hydro-Volt hydrometer arrived this morning from the manufacturer in Germany. Good timing. The latest measurement is 1.237. I imagine "no current flow" also means "no float," in which case my batteries haven't been there for more than a few minutes or so. I can't say for sure how often they've been below 75% SOC. According the battery meters, not much. According to SG, could be quite a bit. That's actually sort-of what the charge controller profile I'm using now does. I discharge every night, and charge every day. Charging normally only uses bulk; no absorb. I have SOC on the low end limited to 75% before the system goes back on-grid. Bulk in theory brings SOC up to around 85%. With enough sun, float can bring it up close to 100% according to the meter, but it's a lower current charge than absorb, so hopefully easier on the batteries. It's also using power that I would otherwise be exporting to the grid at 10 cents per kWh, so the efficiency factor isn't a concern. Then once every 14 days, the system does a full absorb. Any EQ cycles have to be done by hand, like I'm doing now. I have two of them, they are the " Cats Pajamas ". It's really hard to go wrong with one, takes one more excuse out of the excuse book though. I noticed that a slight tilt to the left or right can change the reading. Is there some trick to holding them level? I know how painful acid burns can be, so I rinse everything between each use. You'v really got to make sure you get it completely full, with no air at the top. I wish the bulb was just a tad bigger. It should read the same no matter how it's tilted ( side to side ) but held vertical. I will rap it a little and make sure there is no air trapped between the wheels. It seems like after you use it a while the plastic inside gets the mold release off the surface and the wheels move smoother and not as many air bubbles, if you know what I mean. This last reading went backwards from the previous one. I worked hard to make sure it was completely full, but the readings still changed with tilt. Maybe there was some air trapped between the wheels, as you said. I guess there's still some technique involved, in spite of the apparent simplicity. I tested it against one of my battery suppliers $3,500 digital SG meter and it was right on. I did change that piece of tubing to a piece of flexible Silicone tube. like I said once that plastic loses the surface tension it'll work a little smoother. I have washed it in the sink and pulled in dish detergent through it and cleaned the crud out several times and flushed it clean with DI water, I don't use distilled. The one in the shop has been dropped on concrete many times and kicked a few times and keeps on ticking. I asked them to send a slightly longer tube, and I think they did. The one I have is roughly 9 inches long and has a fair curl to it. I'll look around and see if I can find something better. I use DI water, too. I have probably been over-optimistic in my interpretation of their marketing-speak: "inflow duct avoids bubble formation; no need to tap the case to remove air bubbles before reading." I think Bill is not warning you about acid burns. I think he is warning you to to keep the insides clean so the wheels and bearings don't get sticky. If Bill is, in fact, warning you about acid burns, then let me be the one to warn you: Keep the insides clean. I'm sure you're right about Bill. What I was trying to say is that I clean the inside after every use because I've experienced how even when acid is on the inside of things, it can drip, leak or splatter and cause burns. Not to mention that you'll end up with acid holes in every shirt and pants you own ..... lol. Heck, I even get them in my pajamas where I go into the shop to check on a battery at night. -Bill "in the 3rd person" B. Finally, success with the EQ. It took 4 hrs yesterday at 62V / 30A (3.2%), and another 6 hrs today -- 10 hrs total, not counting the time at 60.4V, above absorb but below EQ. Any idea how that compares to other battery banks of a similar size for a first-time EQ? SG is now 1.265, vs. nominal 1.260 for 100% SOC. I'm starting to get the hang of the Hydrovolt. I find I have a refill it about 5 times, squeezing the bulb as hard as I can each time to get the air out, before I get a stable reading. I also found that I can set the meter on top of the opening to the cell while the tube is inside, and use the opening to both make sure it's level, and as a way to gently tap it to make sure any air bubbles have settled (since I hold the cap in my other hand). I suppose it's a little more challenging than usual to measure SG during EQ than it would be at other times, due to active gassing; a few small bubbles in the incoming electrolyte are inevitable. Now to confirm SG in the other 23 cells, then see what it takes to maintain a good SG in my day-to-day usage scenario. I think getting the charger's internal battery meter adjusted so that it provides more accurate readings will be part of it. Although the charger doesn't use the reported SOC, the inverter uses it to determine when it should stop drawing from the batteries and go back on-grid. If the system reached a true 100% SOC every day, there wouldn't be a problem, since I'm sure measuring discharge alone is accurate. The problem is that errors accumulate when it doesn't reach full charge (charging is normally done from PV power only), then discharges again. This doesn't sound like my hydrovolt. They do NOT need to be level. You shouldn't need to refill it 5 times and you shouldn't need to tap it. Maybe that's the problem... I never open a battery cap while gassing. It's very easy to stop absorb or equalization for a couple of minutes while I check SG. Its very easy to resume absorb or equalization. It's very easy to stop absorb or equalization for a couple of minutes while I check SG. Its very easy to resume absorb or equalization. For most chargers / operation modes, that's probably true -- including mine, in it's default mode. Once configured in self-consumption mode, however, like it is now, if I stop absorb or EQ, I can't start it again until the next day. At the end of bulk today, SOC based on SG was 84%. At the end of absorb (at 58.8V), SG read 90%, while the battery meter said 100%. The meter is configured with SOC at end of bulk = 85% -- very close -- and with charge efficiency = 91% -- which seems far from reality. I know charge efficiency actually varies with SOC, and in the 85 to 100% range, it would be at its lowest, particularly during absorb, when energy is being consumed by gassing. SG-based SOC increase during absorb was 6% vs. battery meter's 15%. That's closer to 37% efficiency. Ack. Maybe the meter is doing something else I'm not aware of yet, like setting SOC to 100% at the end of absorb. Hopefully. I have absorb set to end when charge current is below 13.9 A (1.5% of C/20) -- apparently not low enough (I can run on time alone, but have decided against that, since bulk doesn't always seem to end in the same place in self-consumption mode). Someone else on the forums here was saying they end absorb at 0.5% of C/20, IIRC. I guess I can try some tweaks in that direction, and see how they work. I just found a chart from a paper where they measured charge efficiency based on SOC. The study was specifically designed to address the issue that I've just run into: charge efficiency when your normal operating range is near the top of SOC. They make the point that moving to larger batteries can actually end up being a very negative thing in some systems, because the typical SOC is higher, so the charge efficiency is lower. I knew the general theory here, but I'm surprised at the actual numbers -- around 50% average charge efficiency when operating between 85 and 100% SOC. 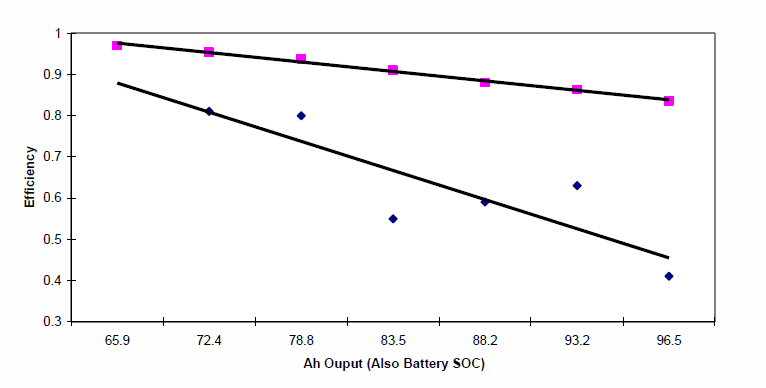 In the graph, the top line is total efficiency from empty to the indicated SOC. The bottom line shows efficiency at a specific SOC. That was me, although my batts are tubular plated forklifts with SG of 1.29. The value was arrived at by setting absorb for an absurdly long time and then monitoring the charging amps into the battery. When the current stopped decreasing, that was the value I used to end absorb. Maybe, maybe not. Those batteries are subject to stratification. When a battery is stratified you can have a "false" end amps. That means if you watch the current into the batteries during absorb (set absorb time to forever) you will see a plateau where the current no longer decreases with time. That plateau can occur before full charge if the battery is stratified. If your absorb voltage were higher you might get better mixing of the electrolyte and you will find that that your end amps current is higher. It takes time at high voltages to stir the electrolyte. If you have shallow discharges you still need the time. That means you are subjecting your batteries to more gassing for fewer amphours. Batteries are dying in many ways at once. Your relatively shallow discharges may increase the battery's cycle life, but reduce its grid-corrosion life. More and more charge controllers are allowing you to skip bulk/absorb on days where the SOC is fairly high. This means you have fewer, but deeper cycles. As long as you are in the linear range of the cycle life chart, that will reduce your overall cost of kwh throughput in your batteries, and raise your overall charge efficiency. Another strategy is to intentionally deficit charge (lower absorb voltage and/or less time) for a week and then do an equalization once a week to catch up. That's the approach I'm considering, as well. I do see a plateau, at around 7A (0.8%). I'm not sure that's the "ultimate" bottom, but it stayed there for several hours. I just did an EQ yesterday, and the batteries were gassing well today, so I would be a little surprised if they were still stratified, although I guess it's possible. I'm now at the top of Trojan's recommended range for absorption voltage. I know NorthGuy ended up going well above that (and even above EQ), but I'm reluctant. I'm running daily absorbs at the moment, but once I get the charging profile figured out, the usual configuration is to only run bulk (and float if it finishes bulk), and then absorb once every 14 days or so. At the moment, I'm trying to make sure that when it does do an absorb, that it gets as close to 100% SOC as possible.